Veteran Christine Dare said she's lost several friends to overdoses. That's just one concern raised by U.S. representatives in a letter sent to Kansas City's VA Medical Center. 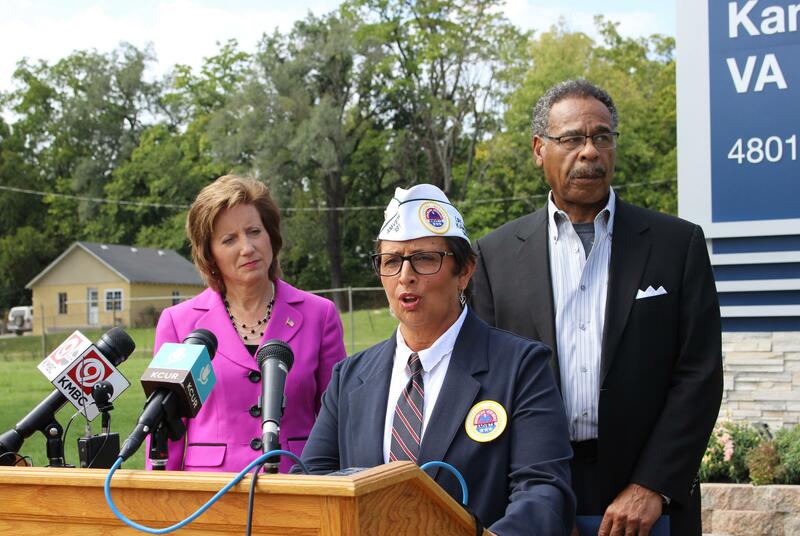 Republican U.S. Reps. Vicky Hartzler of Missouri and Kevin Yoder of Kansas, as well as Democratic U.S. Rep. Emanuel Cleaver of Missouri, met with the VA on Tuesday to discuss the issues outlined in their July letter and check on what progress has been made. Hartzler said long call center wait times was a major issue. "Too many times they called and it would ring and ring, and they couldn't reach a real person, or they would be put through to voicemail," Hartzler said. "That's just not acceptable when you are calling for help." Since July, she said, the VA Medical Center has hired 10 additional nurses for the call center, reducing the average call wait time from four minutes to one. Another concern for many veterans and their family members is opioid addiction, which can stem from doctors overprescribing pain medication. Cleaver said there's no simple solution to the problem. "A lot of the people addicted were simply trying to deal with a problem of constant pain," Cleaver said. Veteran Christine Dare said overmedication for pain management has been her biggest concern. "I have quite a few friends that are no longer with us because they overdosed on purpose because of PTSD," Dare said. Dare said she's pleased the VA seems to be taking this concern seriously by offering alternative pain management options at an "integrated pain clinic," where staff discuss opioid alternatives like chiropractic care, psychiatry and acupuncture with veterans. At Tuesday's meeting, the VA reported they have seen increased use of these services. According to Hartzler, a VA pharmacist shared numbers showing a decrease in opioid prescriptions from 11,218 in 2008 to 4,505 so far this year. They have also decreased the number of tablets per prescription to require more contact with a physician — that number, on average, has gone from 106 to 77 tablets since 2008. Another concern that veterans told the lawmakers was a significant fee that accompanies using an ambulance to get to the VA Medical Center. By law, the VA is authorized to reimburse hospitals or providers for stabilizing a veteran in an emergency, but Hartzler said there's some confusion about how that law applies after the patient is stabilized and transported to the VA for care. "Unfortunately, the VA does not believe the law allows them to pay for this transportation from a non-VA hospital to the VA facility," she said. "I think that's wrong." Hartzler said VA officials were receptive to changing this policy Tuesday. Yoder did not attend the news conference.